Since our founding in 2005, the artisans at Bella Faux Finishes have taken the wishes of homeowners, business owners and interior designers and incorporated them into our creation of stunning new faux finish designs. At Bella Faux Finishes, we believe the sky is the limit. Through our faux painting techniques, we can custom create a design that suits your tastes and needs. Concerned about upkeep? Protective coatings can be added to many of our designs to increase durability. A good set of tools can make the biggest difference in the finished product. The tools of an artisan faux painter are much different than that of a Venetian plaster or Italian finishes artisan. 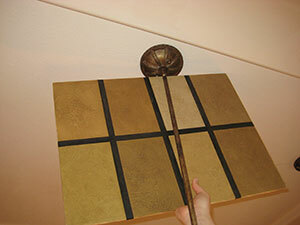 Faux painting can involve nearly any type of artistic utensil. At Bella Faux, our Sioux Falls artisans use only the best faux finish materials and tools available, from trowels to paint brushes, sea sponges, feathers, stippling brushes, softener or badger brushes, veining brushes, mottlers, over-grainers, floggers and cloth rags. Sometimes, even plastic bags or newspapers are used as tools to create a unique and original faux finish. Here are a few of the decorative painting techniques used by Master Artisans to create a dramatic effect. Faux Finishing methods can range from Stenciling, Marbling, Glazing, Gilding, Sponging, Murals, Trompe L’oeil, Wood Graining, Painting, Stippling, Color Washing, to Antiquing. So as you can see the possibilities for you and your Decorative Artisan to create “The Wow Effect” on a project are unlimited. Pricing for our faux finishes and other decorative finishes is based on square footage in relation to the cost of materials and the difficulty of the application. Let’s say in efforts to save money you decide to go with a relatively small faux finish design project. The pricing for our simple glaze finish would be the most affordable option. A glaze is a relatively easy finish to complete, but it can also be a nightmare if you choose an inexperienced artisan for the application. 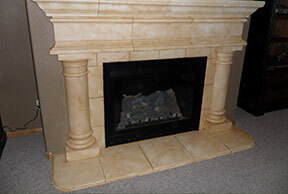 Contact us today to get a price quote on our glaze and other types of faux finishes. 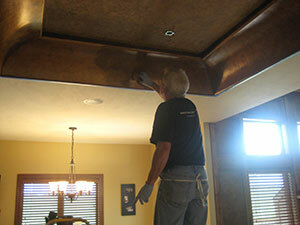 Get the Professional Faux Finish You Deserve! Don’t settle on subpar interior design services. 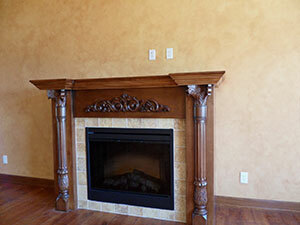 Bella Faux Finishes employs only the most qualified artisans for our decorative finishes. We are also working with a number of companies in the states and beyond in efforts to bring even more faux finish options to Sioux Falls and the greater Midwest. Subscribe to our blog for the latest information on our innovative decorative finish techniques. You can also opt to fill out the attached contact form to receive information via our free newsletter. 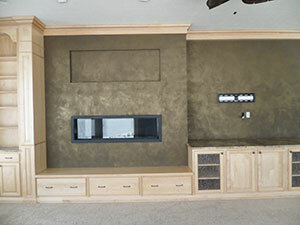 See our photo gallery for examples of our current faux finishes. 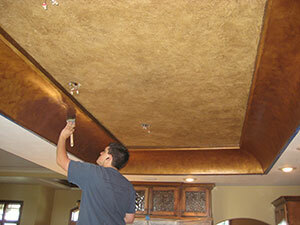 Do you have ideas for your next faux finish project that you would like to share with us? Call to arrange a free, no-obligation consultation. We would love the opportunity to share our interior design ideas with you too! In addition to Sioux Falls, Bella Faux Finishes proudly serves homeowners and business owners in Sioux City, IA, Dakota Dunes, Wynstone Estates, Lake Okoboji, Lake Madison, Omaha, NE, Minneapolis, MN, St. Paul, Minnesota, La Crosse, Wisconsin and the surrounding Midwest region.